I wanted to briefly write about our Sea Days on board the Summit. Not a huge entry – but never the less, a few notable worthwhile mentions. 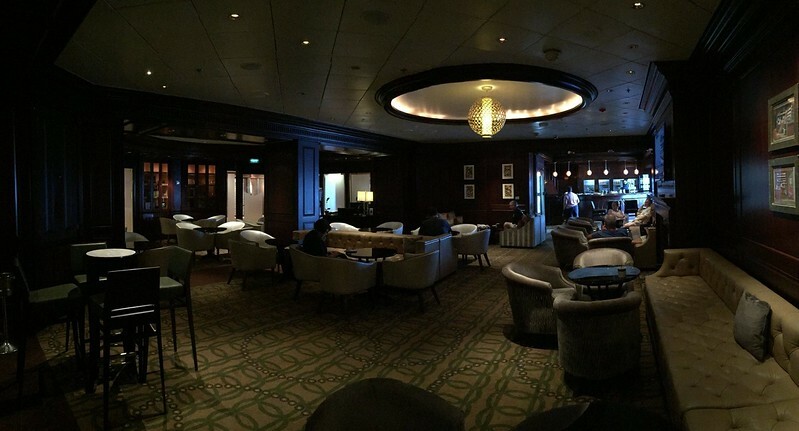 First of all – our favourite place to hang out is on the starboard (non-smoking) side of Deck 4 on the M-Class ships. 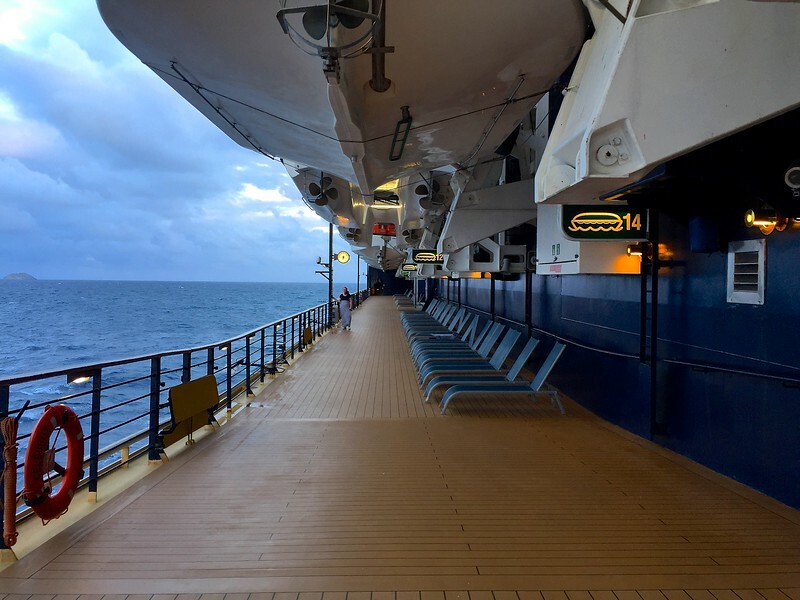 It is not only our favourite place to have an evening stroll, but during the day time we enjoy grabbing a lounge chair and listening to the waves splashing away from the ship. It is peaceful, tranquil, and pure relaxation for us. We chose chairs closer to the forward area of the deck and near the entrance way not far from Michael’s Lounge. It was super convenient to get up and retrieve a soda, water, or drink from the lounge and bring it out to our outdoor hideaway. Speaking of Michael’s Lounge above, we actually made good use of the lounge on this trip. We frequently visited the lounge for specialty coffees, pre/post dinner drinks, and on wet, cooler sea days – a nice retreat to enjoy each other’s company and tackle challenging Sudoku puzzles. A few times during our evening stroll, we would sit and relax in one of the lounge sofas and listen to the music being played. It was a lovely way to spend a relaxing evening, prior to heading to the room. We did manage to watch a couple of movies (Fantastic Beasts and Where to find them; and La-La Land) and we thoroughly enjoyed the opportunity to see these movies on board the Summit’s rooftop terrace. We had a bottle of wine we had not opened as of yet, so I grabbed a pair of wine glasses & the bottle and enjoyed wine with our movies. We also zipped down to the Oceanview Café (two flights below us) for some pizza slices. Pizza, Wine, and a Movie – how great is that? Although enjoyed very much, I have to say – we wish there were more! I know I know – a bit greedy, but watching movies on the rooftop terrace is such a great experience, I wish more movies were scheduled. There were two activities that we decided to participate in on this trip. The first was “Walk for a Cause”, World Wildlife Fundraiser to bring awareness of the plight of the coral reefs. 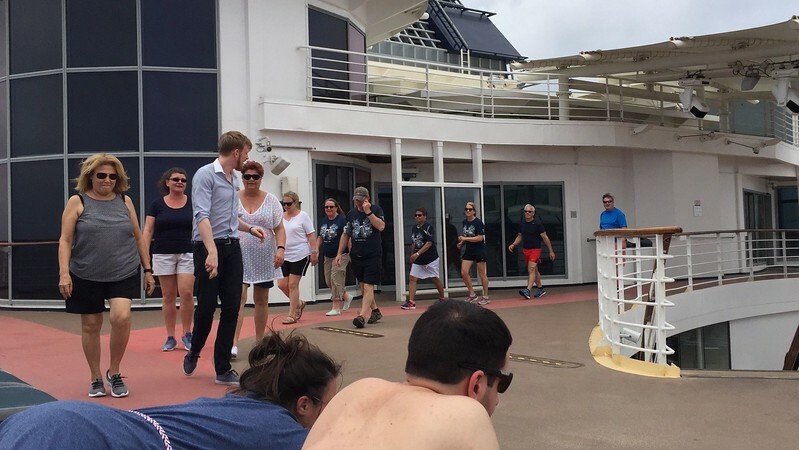 Anthony & I both purchased a fundraiser tee-shirt and then I joined a few others as we walked around Deck 11, as we walked for a special cause that was close to my heart. The second activity that we decided to join in on was a water colour class in the main dining room. It was part one of a series and although fun – after trying to paint a beach house, we realized neither of us were a Van Gogh (but perhaps a Salvador Dali?) and decided not to return to complete the series. The activity itself was fun, but the poor staff were overwhelmed. They were expecting no more than 25 guests and over 80 of us showed up. We were supplied a complimentary water colour kit that was impressively stocked. Most of us just began painting on our own, rather than waiting for the instruction, as mentioned above the staff were overwhelmed by the popularity of the event. Although not an activity per se, I did attend the “Sushi making Demo” in Sushi on 5. Again, a very well attended event (standing room only). The demonstration was interesting although because of the large crowd, the Chef had a difficult time “voicing” his demonstration to the audience. He composed several Sushi dishes and the audience was invited to try them after the demo. I sadly had to refrain, as all of his dishes were meat/fish based (no vegetarian options).